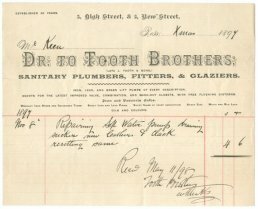 The Tooth Brothers were plumbers, fitters and glaziers with shops at 3 High Street and 5 New Street. 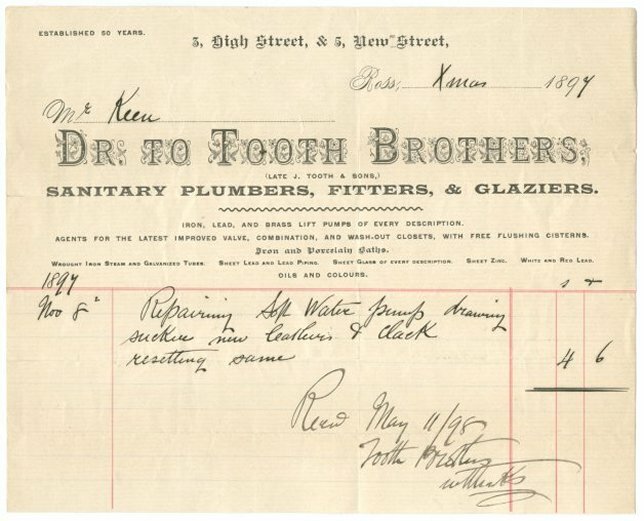 They supplied iron, lead and brass lift pumps and iron and porcelain baths to name but a few items. The receipt was for the repair of a water pump. 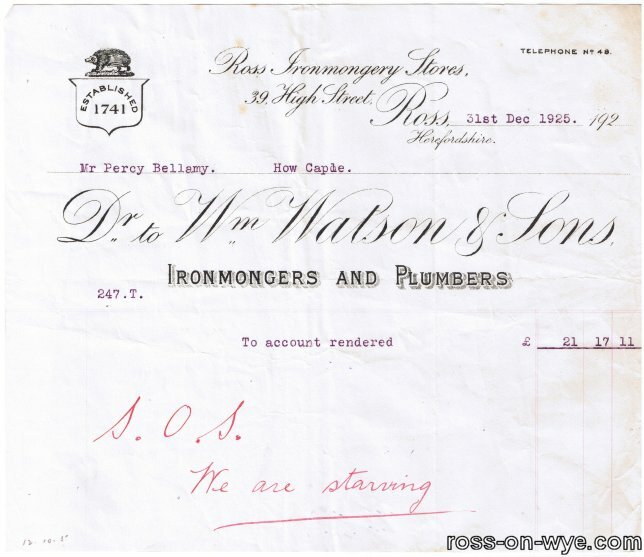 This receipt dates from Xmas 1897 and was settled on 11th May 1898. J. 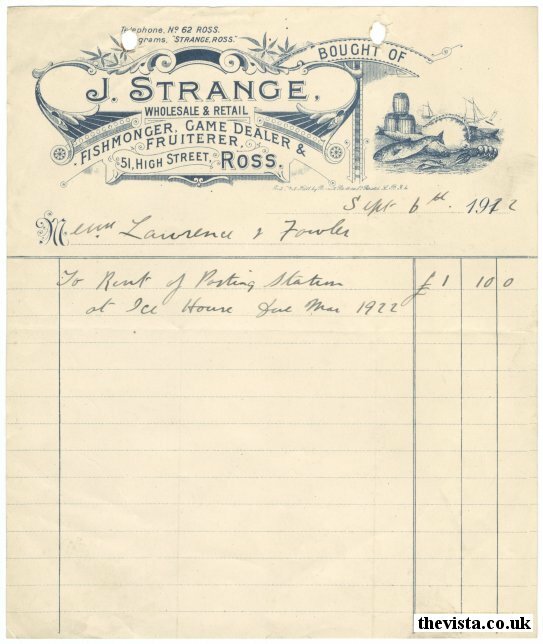 Strange was a fishmonger, game dealer & fruiterer based at 51 High Street, Ross. 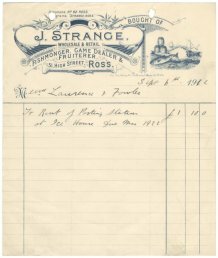 It is a receipt made out to Messers Lawerence & Fowler for the rent of a Posting Station at the Ice House which was due in March 1922. 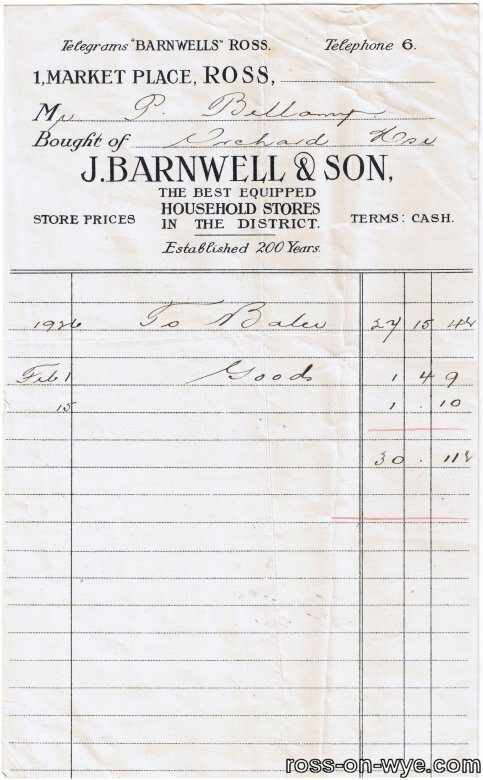 This receipt dates from 8th December 1922. 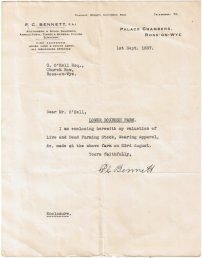 P.C.Bennett F.A.I was an Autioneer & Stock Salesman, Agricultural, Timber and General Valuer and Surveyor. Additionally he was a Fire Assessor, House, Land & Estate Agent and all assurances effected. The offices were in Palace Chambers, Ross-on-Wye. This item dates from 1937. 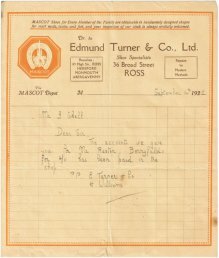 Edmund Turner & Co. Ltd were shoe specialists in Ross carrying out repairs by modern methods. MASCOT was their brand of shoes and these were shoes for every member of the family are obainable in handsomely designed shapes for the needs, tastes, and feet, and your inspection of our stock is always cordially welcomed. 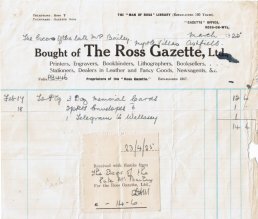 They had branches at 43 High Street and 36 Broad Street in Ross and also in Hereford, Monmouth and Abergavenny. This item dates from 1928. 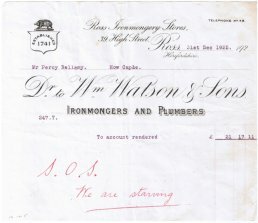 Wm Watsons and Sons were ironmongers and plumbers at 39 High Street Ross. 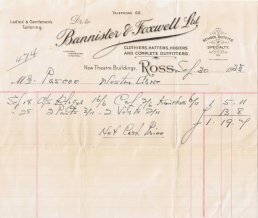 This is a statement of account to Mr. Percy Bellamy of How Caple and he owed £21 / 17s / 11p. The statement has a note added to the bottom stating "S.O.S. We are Starving". It is interesting to note that the Watsons logo involves a hedgehog. 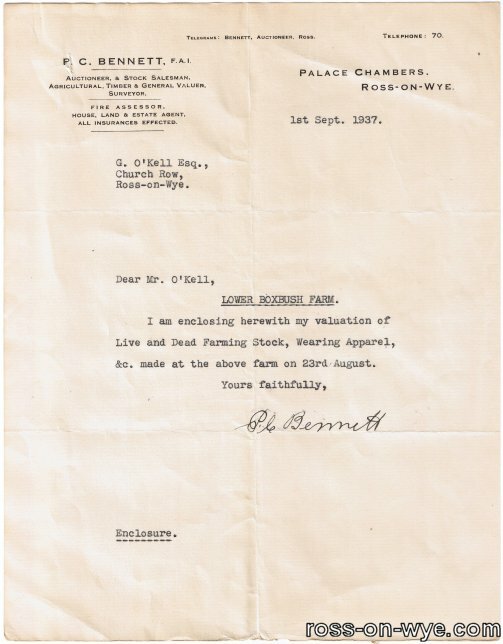 This item dates from 1925. 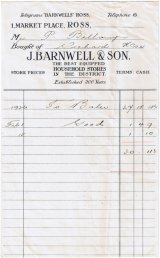 J.Barnwell & Son were a household stores and were the best equipped stores in the district. This is a statement of account for Mr. P. Bellamy. 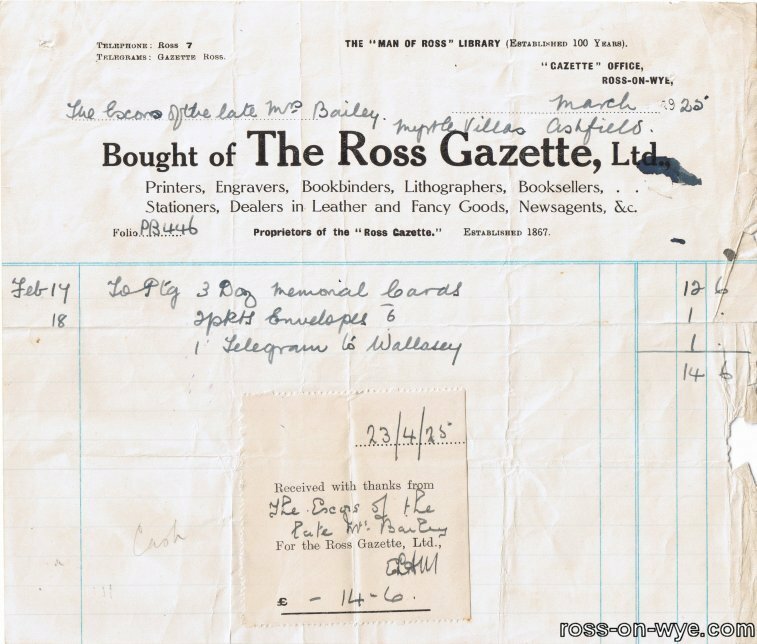 This was a bill to the Exec of the late William Bailey of Myrtle Villas, Ashfield, from March 1925. 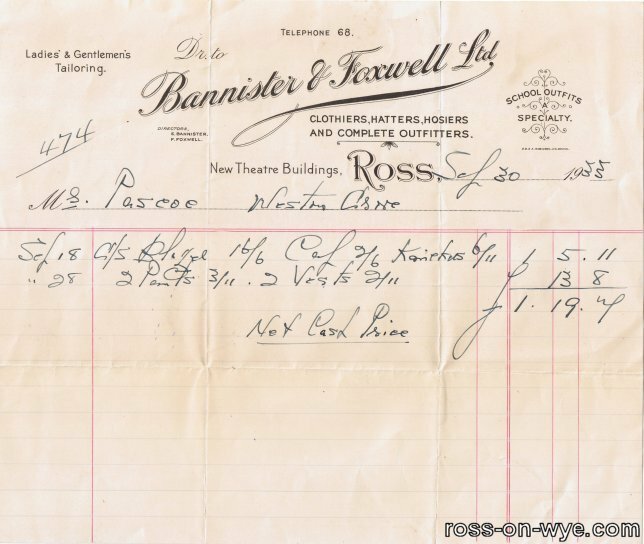 This was a bill from Bannister & Foxwell Ltd, who were clothiers, hatters, hosiers and complete outfitters, to Ms. Pascoe from Weston Cross and is dated 30th Sept 1933. Charles Francis was a wholesale tobacconist at 47 High Street. 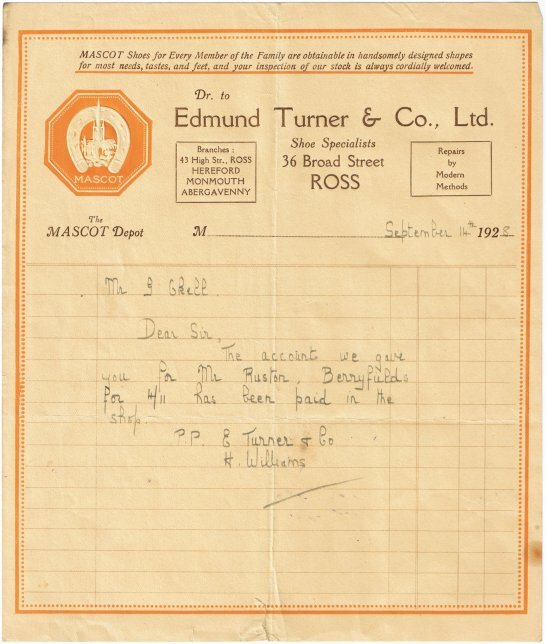 This was a bill to a Mr. J. N. Suter of Gloucester Road, Ross from the 5th December 1932.